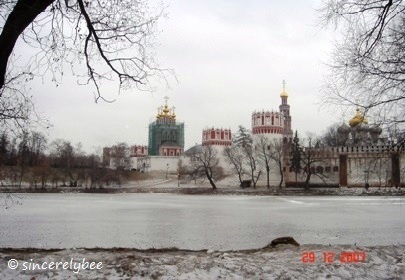 BESIDES NESKUCHNY PARK (link), we also have fond memories of our time at Novodevichy Park, which was a short drive from our Moscow home. Autumn in Novodevichy Park, 28 October 2007. Waddling with the mother-duck. 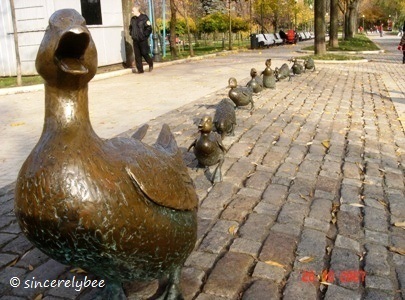 Mrs. Mallard and her eight ducklings, which are replicas of the original duck family in Boston Park, USA. We love them in any season – autumn (28 October 2007) and winter (29 December 2007). Standing on the same spot seasons apart… in autumn where the stunning leaves were clearly reflected in the lake (28 Oct 2007) and in winter when the lake was frozen (25 Feb 2007). (Top) Our visit on 25 Feb 2007, we were fascinated to see the whole lake frozen and more fascinated that people were enjoying themselves on it without the fear of the surface giving way! 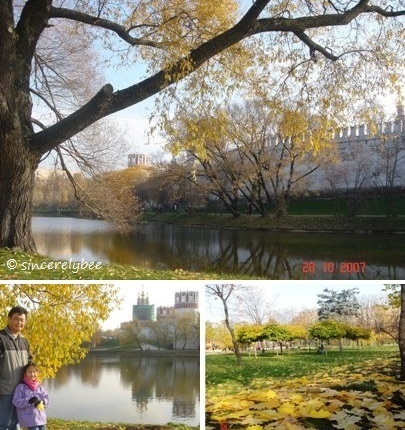 ; (Bottom, L) M and Papa on the lake against Novodevichy Convent on a clear day. Winter in Novodevichy Park and Convent (29 Dec 2007). Founded in 1524, the convent was declared a UNESCO World Heritage Site in 2004. This entry was posted in Memories of Moscow and tagged Moscow, Travel. Bookmark the permalink.